Anderson, Kay. Vancouver's Chinatown: Racial discourse in Canada, 1875-1980. Montreal Buffalo: McGill-Queen's University Press, 1991. "China's Age of Invention," with Robin Yates, "Secrets of Lost Empires," NOVA, February 29, 2000. Immigration Act of 1924 (Johnson-Reed Act) - Wikipedia | National Archives | State Dept. Camacho, Schiavone. Chinese Mexicans: Transpacific migration and the search for a homeland, 1910-1960. Chapel Hill: University of North Carolina Press, 2012. Open Door Policy (Sec. of State John Hay) - Wikipedia | State Dept. The Chinese in California, 1850-1925 (Teacher's version) - Library of Congress (links to numerous resources). Also see Chinese in California, 1850-1925 from the Bancroft Library at the University of California, Berkeley. "The Chinese Must Stay," by Yan Phou Lee, North American Review, 148 (April 1889) pages 476 - 483, Federal Judicial Center. Also available as an 8-page PDF transcribed by Cassandra Bates in 2006. Treaty of Tientsin (1858) - Wikipedia | text on Wikipedia | State Dept. Treaty of Wangxia (Wanghia) (1844) - Wikipedia | State Dept. United States v. Wong Kim Ark, 169 U.S. 649 (1898) (A person of Chinese descent, born in the United States to Chinese parents, is an American citizen by birthright) - Findlaw | Wikipedia | Was U.S. vs. Wong Kim Ark Wrongly Decided? Yick Wo v. Hopkins, 118 U.S. 356 (1886) (even if a law is race neutral on its face, if it is applied in a prejudicial manner, it violates the equal protection clause (Section 1.) in the 14th Amendment)- FindLaw | Wikipedia | State Dept. See also Related Publications and Timelines and Political Cartoons from the era. Have a suggestion for Forbidden Citizens? If you have a suggestion for a change or addition to a future edition of Forbidden Citizens, please contact us or complete our online suggestion form. "Our nation has the greatest ideals, standing as that 'city upon a hill' for the world over to look toward with hope. Yet we have not always been as welcoming as we have proclaimed. 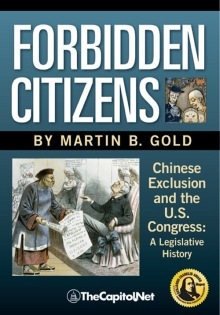 Forbidden Citizens by Martin Gold tells the story of the exclusion of a specific group, the Chinese people, for racial reasons that were expressed in the most shocking terms. It is thorough, thoughtful, and highly relevant today. This work presents the best scholarship in the most accessible manner.."